Once you purchase a Gift Certificate, please contact Sunshine Music Together LLC directly at info@sunshinemusictogether.com and we will email you a gift certificate PDF to print. 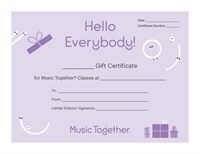 Please have your recipient contact us at info@sunshinemusictogether.com with their certificate number and to indicate which class and location they would like to use the certificate for. There is no physical gift certificate mailed.